I thought I had it tough as a boy refugee during, and as a displaced person after World War II. Peanuts on that! Just read Moore-Morrans’ memoir of his growing up years in Campbeltown, on the Kintyre peninsula, Argyllshire on the west coast of Scotland during the Great Depression. Ian adds or better said, subtracts from my concept of poverty to give it horrifying dimensions. “Yes, we were destitute!” he writes. “…we were, without doubt, the poorest family in that little town. – “…we were the poorest, by far, for no one else in our town lived in such pathetic conditions as we did.” Home, was a 10 foot square room in an attic of a run down house, practically unfurnished and most of the time unheated. Clothes? Best described as rags. It was not until Ian enlisted in the Royal Air Force at age 18 that he discovered “what it was like to have a full belly of half-decent food”. Get away from it all. Australia? Best to go to Ontario? Canada? Yeah, sure. Be brave and read on. My immigration to North America was like a Cinderella experience but Ian’s more like a nightmare. Starting with misunderstanding and misrepresentations of what to expect in Canada from certain Ontario government agents to watching their belongings get dropped to the ground by a malfunctioning crane, smashed at their port of entry, all in all made Moore-Morrans’ immigration a “…Poverty to Poverty” ordeal. The Morranses, a family of four now, Mom (Mary), Dad and two daughters (Audrey and Shirley) finally did manage to purchase a new home at Hillsburg, Ontario in 1970. “We’ve come a long way,” he writes. Indeed they had come a long way in many and varied ways on a road resembling an obstacle course. I was fortunate, but many an immigrant will identify with Moore-Morrans’ experience. I dearly recommend Ian’s book. An eye opener for sure. This entry was posted in Biographical info, Book Review, Canadian theme, Immigration/emigration, memoir, Scottish theme, self-publishing, Writing and tagged family, Harry G. Kapeikis, immigrant experiences, Moore-Morrans, overcoming poverty, Poverty. Bookmark the permalink. We’re surprised to hear that you find several of our posts “rife with spelling issues.” We are wondering if you might be pointing out our use of the British way of spelling, as opposed to the American way. (An example would be the use of “ou” in place of “o” as in “neighbour.” We are Canadians and so use the British way of spelling. I (Gayle) am the blogger and, though American-born, changed my way of spelling sometime after I emigrated to Canada and became editor of a Canadian magazine. I’ve kept up that way of spelling in retirement and, as Ian is British-born and I edit his writing, that method has worked out well for us. Then, too, Ian speaks Scottish-English so when he writes about Scotland in either his novels or memoirs, he uses what I call “Scottishisms.” Some of those words are only found in Scottish-English or may mean something entirely different in Scotland than they do in other countries where English is spoken. 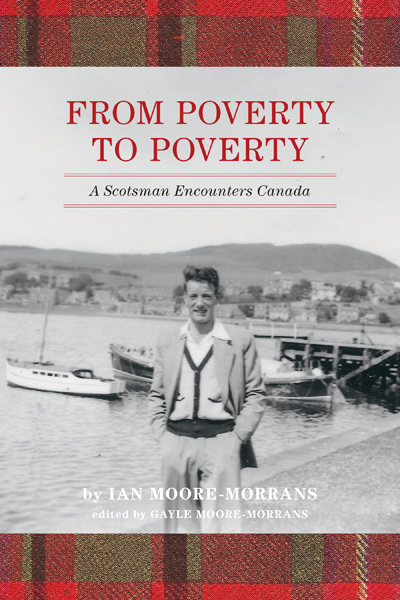 We’ve pointed that out in some of our posts about his memoir, “From Poverty to Poverty: A Scotsman Encounters Canada.” I had quite an education in “Scottishisms” when editing that book! In addition, I had to turn off the spell-check as my word-processing program gave up on providing corrections! Of course, even editors sometimes need to be edited; however, I try to double-check whatever I post. We’d be interested in hearing from you further so that you could point out some examples of those spelling issues. Looking forward to hearing from you. A great review, Ian. Congratulations! Thanks, Nita. Great to hear from you and get your congratulations. This morning we had a phone call from a 90-year-old Scotsman from Armstrong who has been in BC for over 40 years. He just finished reading Ian’s book (borrowed it from the Armstrong library) and said he could identify with a lot of Ian’s experiences – growing up in extreme poverty in Scotland, joining the Royal Air Force and then immigration to Canada. He and Ian had a nice “Scottish-accented” chat and the “burrrrrrrrs” got stronger the longer they talked. The gentleman said that he could almost rewrite Ian’s title for himself, naming it “This Is My Life.” His call was a definite high point for us.